Adds a beautiful touch to any bed...arrived pretty wrinkled though...just throw it in the dryer with 3 fabric sheets and it will fluff up. Give your bed a finished look with our multi ruffled bed skirts. Our basic color story will match any bedroom decor. This luxury bed skirt is designed with 5 layers on each side. Available in a 14-inch drop in sizes of twin, full, Queen, King and California King . This beautiful bed skirt instantly brings class and sophistication to a room. 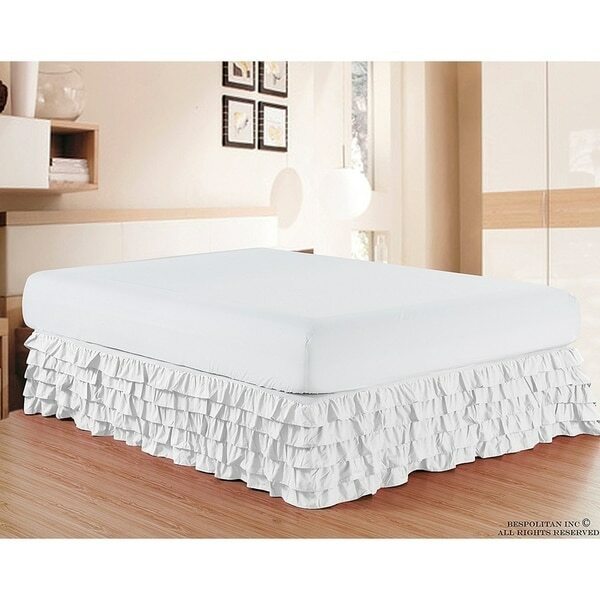 This Multi Ruffled Bed Skirt from Elegant Comfort is sturdy and long lasting. It easily falls over the edges of your bed, hiding any storage area and preventing collection of dust. Ideal for a home with country or cottage interiors. You can complete the look of this bed skirt by pairing it with matching bed sheets, pillowcases, blankets, comforters and duvet covers. This bed skirt can be machine washed and tumble dried to keep dust and grime at bay. this bed skirt looks lovely on my bed. The light blue color is very nice, and I love the tiered layering of the bed skirt. I would recommend this to anyone. I really like this bed skirt. I didn’t realize when I purchased it that it is form fitting to the box springs, which makes it easier when placing it. Good drop length to floor. Ruffles very nice, I bought to go with my Madison park comforter. Well, there’s nothing to dislike about this bedskirt! I purchased the hot pink color for my new bed and it is fabulous! I love the five rows of ruffles on the 15” drop and the fabric is very soft and wrinkle-free, but not polyester. Not sure of the fabric content because I didn’t read the label (my bad!) That didn’t occur to me as I was totally pleased from the get-go. The purchase price was amazing, too. Thank you Overstock.com! I really like this bed skirt. It’s very pretty and playful. This is a bright cheery red color that surprisingly matches the red in my bedspread - not an easy thing to do. I fluffed it in the dryer to get the wrinkles out. Fits great and stays in place. Ruffles are a nice touch. Threw away the old cheap one I had that would never stay in place nor did the red color match. Reading customer reviews really helps - I made the decision to try it and I’m glad I did. Really love it! Doesn’t wrinkle. Wish the drop was longer but it’s much better quality than other ruffle skirts we’ve purchased. This one seems like it will last. I love this!! I thought it looked great online, but it looks even better on my bed. And I didn’t have to iron it before I put it on my bed—just a 20 minute run in the dryer with a slightly damp cloth. Decent bedruffle. Love the additional layers of ruffles. Color is a soft purple, but exactly what I needed. This matches the purple unicorn bedding that overstock Had as well. Just the right color to match my bedding. The ruffles add a great touch. It was just what i was looking for! Thanks overstock for yet another great purchase! Very cute! Arrived on time. Very pleased with the bed skirt. Beautiful bedskirt! I’ve been looking for a while and when I saw this, I had to get it! Great quality as well. Beautiful color as well as quality.. definitely will recommend. I love this sham, it went on very easily and I love the ruffles. The only thing I didn't like was the gray was just a little darker than expected. I typically give 5 stars if I would purchase the item again. This product arrived in perfect condition, seems to be very good quality and matches the description provided. Perfect for the little girl's room we decorated! I ordered in black and am very pleased with this. It fits my standard size guest bed perfectly. The ruffles were pretty wrinkled, but am hoping they will fall out with time. Not happy with this purchase. I cannot use the bedskirt because it does not have split corners. This would work for a bedframe that does not have a footboard. It is a bright white and appears well made, unfortunately I am not able to use it. Read the reviews - hoping for a bed skirt that stays in place plus I needed red and that is sometimes hard to find - usually it’s burgundy. Crossing my fingers! "Is the platform white, or the same color?"